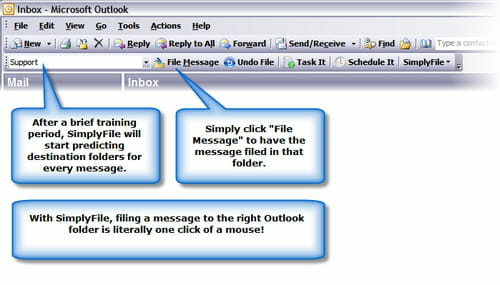 SimplyFile for Microsoft Outlook is a software which enables to manage the mailbox. It has the ability to move an email to a folder. It can also turn email into tasks and appointments. Filing: The program offers strategy to reduce the number of email in the user inbox. He just has to create reference folders and name them as he wants like customer, friends or family. Then move the e-mail in this reference folder. 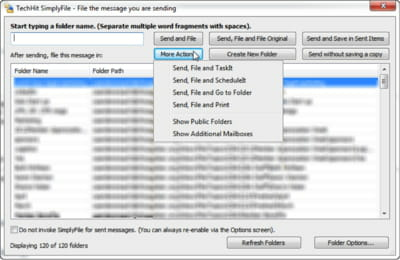 MessageSave: This option in SimplyFile for Microsoft Outlook has the ability to save email out of Outlook. It could be in the hard drive and other devices or as individual files. The format of the message is "msg" and it will safely keep the information. TaskIt: This function allows the user to follow a sent message up. He can also add a reminder to this message and this will warn him of the response he will get later on. It reduces the time of email checking. Its very intuitive interface makes it easy to manipulate. This is a trial version of SimplyFile for Microsoft Outlook. Latest update on June 24, 2015 at 09:11 AM.